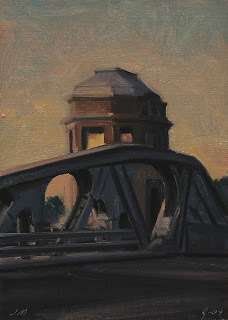 Today's daily painting is of light and shadows falling on a RR bridge creating great abstract shapes. 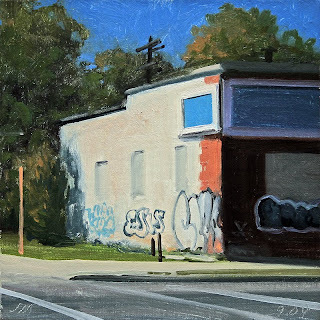 Today's daily painting is of warm September light and deep shadows on an abandoned Detroit corner building. 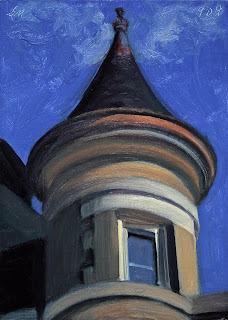 Today's daily painting is of warm September light on a turret of an abandoned Detroit building. 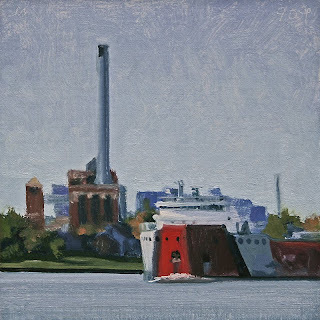 Today's painting is of the Great Lakes freighter the Roger Blough upbound on the Detroit river. 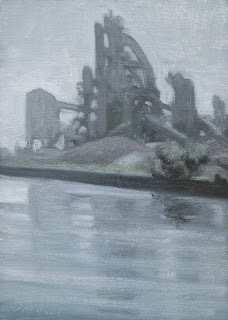 In the background is a power plant in Windsor Ontario. 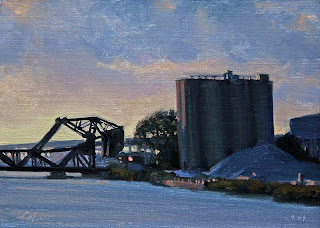 Today's painting is of late evening light on an Industrial Landscape on the Rouge River. 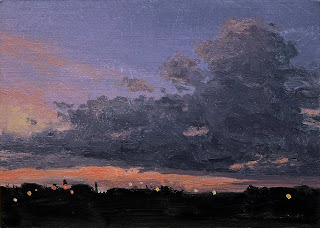 Today's painting is a view late evening light on a dramatic bank of clouds. 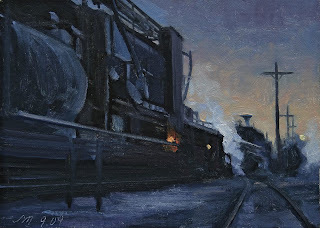 A young art student in Halifax, Nova Scotia has been doing an incredible series of cloud painting for her current show. 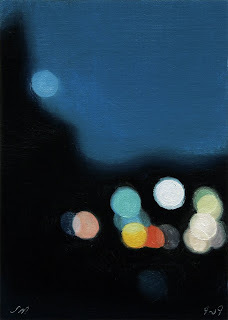 Please take a look at Ambera Wellmann's wonderful paintings. 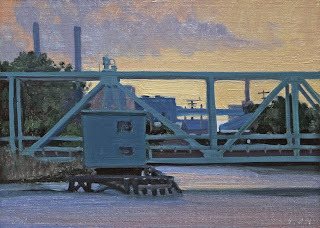 Today's painting is a view of the Jefferson Ave bridge pilot house. 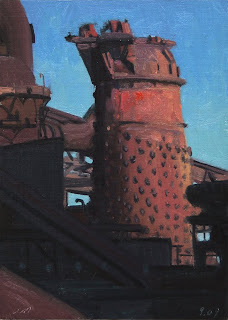 Today's painting is a detail of part of the Great Lakes Steel complex on Zug Island. 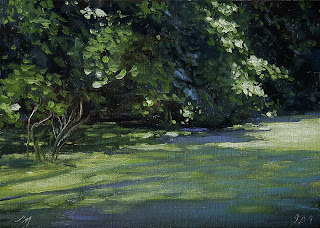 The warm late afternoon gave it a wonderful glow. 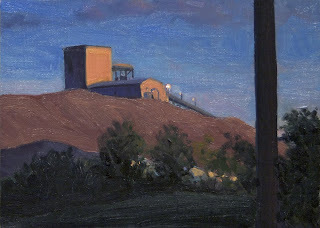 Today's painting is of late evening light on an Industrial Landscape near the Rouge River. 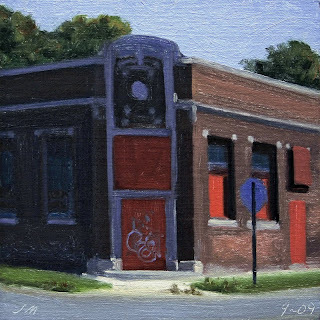 Today's daily painting is of a red corner building in the Brush Park area of Detroit. 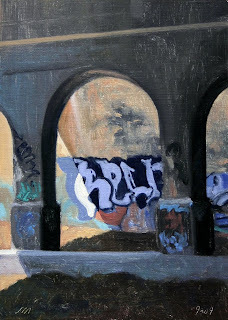 Today's daily painting is of light, arches, graffiti, and shadows on an unfinished section of the Dequindre Cut. 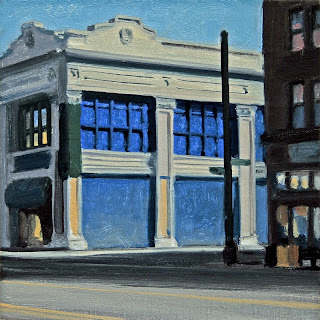 Today's daily painting is of a corner building on Woodward Ave. By now if you haven't guessed, blue is my favorite color to paint. 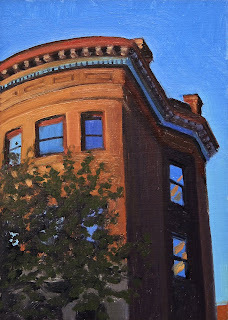 Today's daily painting is of late summer light and reflections on a Midtown Detroit building. 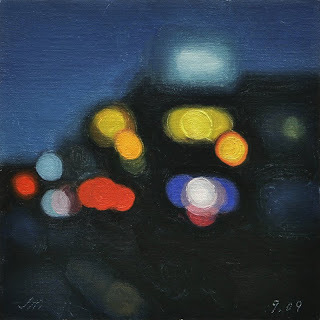 Late evening light in September creates such a clarity of light and intensity of color that this seems almost abstract. 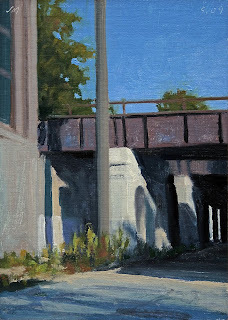 Today's daily painting is a landscape of the Brush Park area of Detroit on a beautiful fall day. 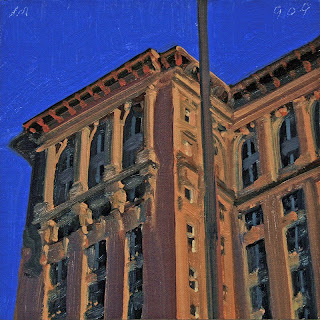 We have had some of the most beautiful weather the last couple weeks here in Detroit. 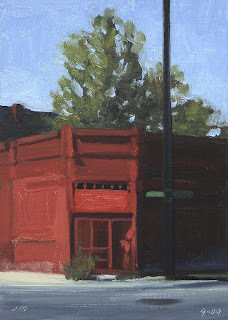 Today's daily painting is of a corner building with red doors. 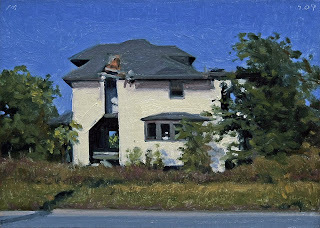 The eighteenth in the series of portraits of abandoned Detroit building. 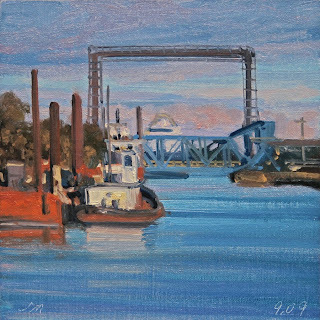 Today's daily painting is of a soft grey view of the Great lakes Steel plant on Zug Island. 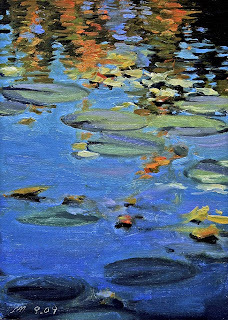 Today's daily painting is of one of Janet's Abyssinian Glads. We got these from "Old House Gardens" online and we are very happy with them. 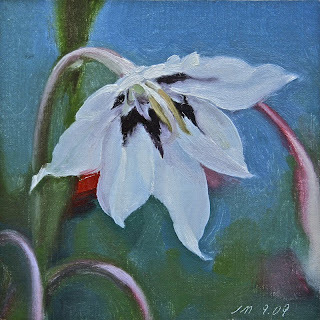 Abyssinian Glads, exotic, late-blooming flowers – white with purple hearts – dip and sway on sturdy, arching stems. Collected from the mountains of Ethiopia in 1844. 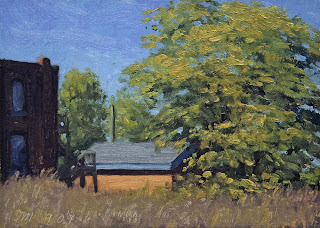 Today's daily painting is of a wonderful Yellow building in front of a deep blue background. 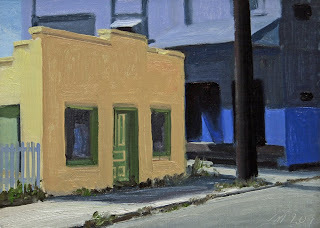 The building is on Brooklyn St just down from Mudgie's Deli. They have some of the best sandwiches, salads and soups in town. 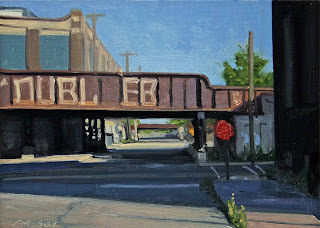 At the corner of Porter and Brooklyn in Corktown. 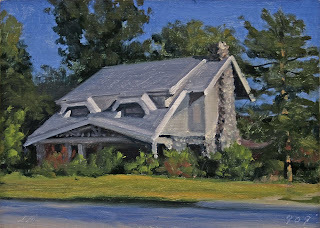 I plan on doing a painting of their corner building soon. 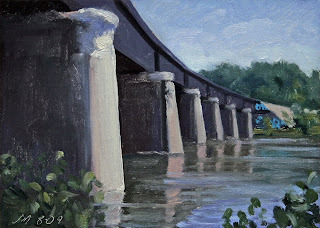 Today's daily painting is of the RR Bridge over the Huron River, in Ann Arbor. Thanks to all for the Birthday wishes. 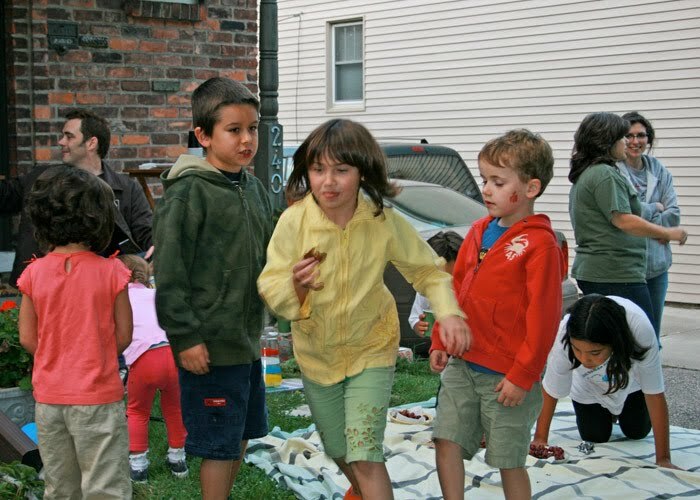 We had a wonderful cupcake party on the front lawn with the neighborhood children and their parents. This is a shot of a few of the neighbor children celebrating my 63rd Birthday, a special way to enjoy my day.